Lymph nodes are small round organs that are part of the body’s lymphatic system. They are found widely throughout the body and are connected to one another by lymph vessels. 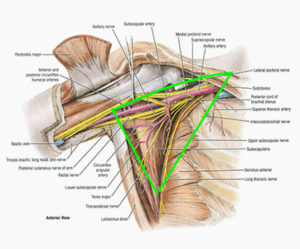 In the neck, underarms, chest, abdomen, and groin are where the majority of lymph nodes are located. Their purpose is to hold and store and process lymph. Lymph nodes are important parts of the body’s immune system. They contain B lymphocytes, T lymphocytes, and other types of immune system cells. These cells monitor lymph for the presence of “foreign” substances, such as bacteria and viruses. If a foreign substance is detected, some of the cells will become activated and an immune response will be triggered. In many cancers, cells from the tumor can break free and enter the lymph system. These cells are picked up by lymph nodes and this is one way cancer spreads. Breast cancer is one that spread through the lymph nodes initially appearing in the under the arm region (known as the axilla). These are the nodes that will be examined to check for spread of your disease. What is the Sentinel Node? Sentinel means the leading or first, so the sentinel node is the first place where cancer could spread. In the breast, it is often under the arm and may be more than one node. So a sentinel lymph node biopsy will be performed to identify which nodes are the first to drain the tumor, sentinel, and they are removed and checked for cancer. What is a Sentinel Node Biopsy? A radioactive dye, a blue dye, or both are injected in the area of the tumor prior to surgery. Your surgeon will then use a probe that can detect radioactive material to locate nodes that hold the radioactive material. An incision is made in that area to remove those nodes that are “hot” with radioactive dye and are blue (if colored dye was used). These are then sent to pathology to look for the presence of cancer. If cancer is present, further nodes may be removed at that surgery or at a later time. What do my results mean and what are the risks? If the sentinel lymph node is negative, then your cancer has not spread and further removal of nodes and potential complications can be avoided. If the sentinel lymph node is positive, it means that cancer has spread and further treatments will be necessary. This could mean further nodes need to be removed, and chemotherapy and/or radiation may be necessary. Your team of doctors will explain all of this in detail in your consultation and follow-up visits. Lymphedema, or tissue swelling. During SLNB and especially more extensive lymph node surgery, lymph vessels leading to are cut and normal lymph flow is interrupted and can lead to build up of lymph fluid. This back up can cause swelling and is called lymphedema. This can be very mild or can progress to a great amount of swelling with hardening of the skin and an increased likelihood of infection in the arm. Severe lymphedema is more common when all the lymph nodes under the arm are removed but can occur even with a sentinel lymph node biopsy. Your surgeon will explain the potential for this. Seroma, or the buildup of lymph fluid at the site of the surgery. Numbness, tingling, or pain at the site of the surgery. Difficulty moving the affected body part. Will I receive a sentinel lymph node biopsy? When will I know the results of my lymph node biopsy? If my nodes are positive, what will be done after that? What is my risk of lymphedema with sentinel lymph node biopsy and with further lymph node removal? What will it mean for me if my lymph nodes are positive?